Preheat oven at 200°C/400°F. Cut Hokkaido pumpkin into bite-sized pieces. Peel and quarter shallots. Clean and halve Brussels sprouts. Peel and mince garlic. In a small bowl, mix olive oil, orange juice, maple syrup, cayenne, cinnamon, ground caraway, salt, and pepper. Transfer Brussels sprouts and pumpkin to a baking dish, add marinade, and stir to combine. Roast for approx. 35 – 40 min. at 200°C/400°F. Meanwhile, mix cranberries, sugar, water, and brandy in a small pot. Let simmer for approx. 10 min., stirring occasionally. Strain cranberry sauce through a sieve, using a wooden spoon to press the juice out of the cranberries. Remove from heat. 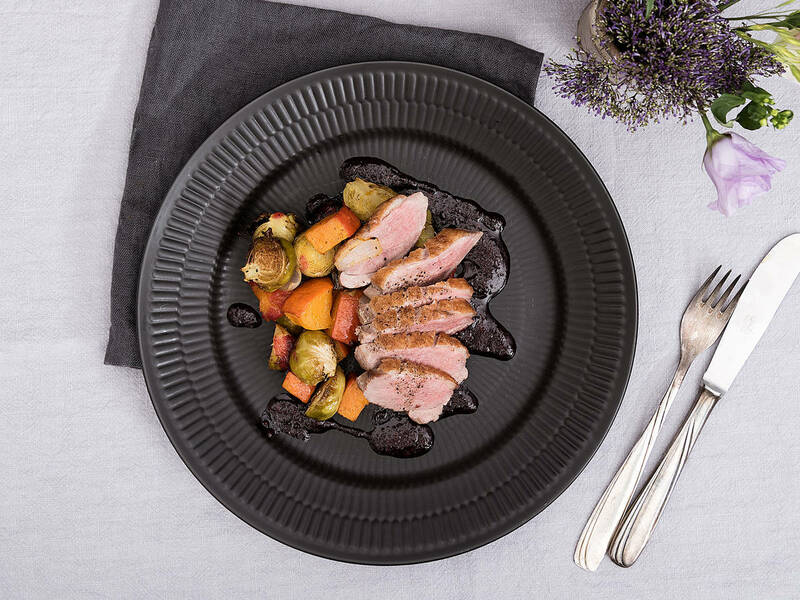 Score the skin-side of the duck breast in a diamond pattern. Transfer to a hot frying pan set over medium-high heat, skin side-down, and sear for approx. 3 – 4 min., or until golden brown. Season with salt and pepper. Flip and sear the other side for approx. 3 – 4 min. Transfer duck breasts to a piece of aluminium foil, wrap, then transfer to the oven for approx. 5 – 6 min. to rest. Remove duck and roasted vegetables from the oven. Remove duck from aluminum foil and thinly slice. Serve Brussels sprouts and pumpkin alongside duck and top with cranberry sauce. Enjoy!